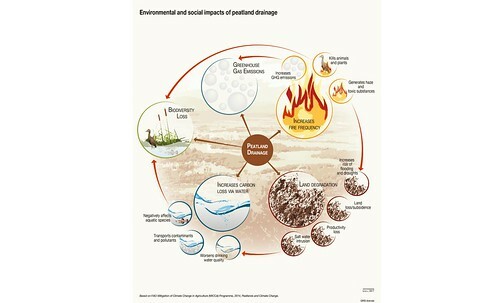 An illustration of the environmental and social effects of peatland drainage. 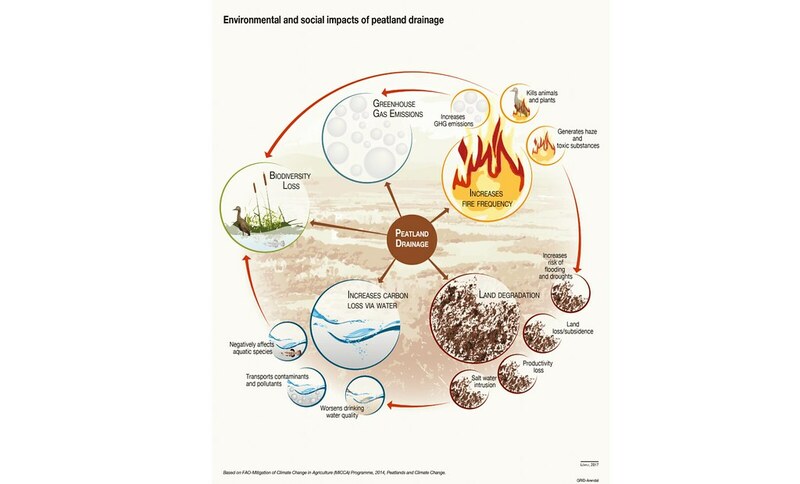 Many human activities in peatlands cause changes in ecological processes, ecosystem structure and species composition (Limpens et al., 2008), usually as a result of drainage and the destruction of native vegetation (Parish et al., 2008). The social and environmental impacts can continue for decades or even centuries, with huge economic consequences. These result in land loss from subsidence, fires and their associated haze, reduced water quality, loss of unique biodiversity, loss of the potential for the sustainable use of peatlands (paludiculture), as well as a contribution to global warming caused by loss of peat carbon stocks.